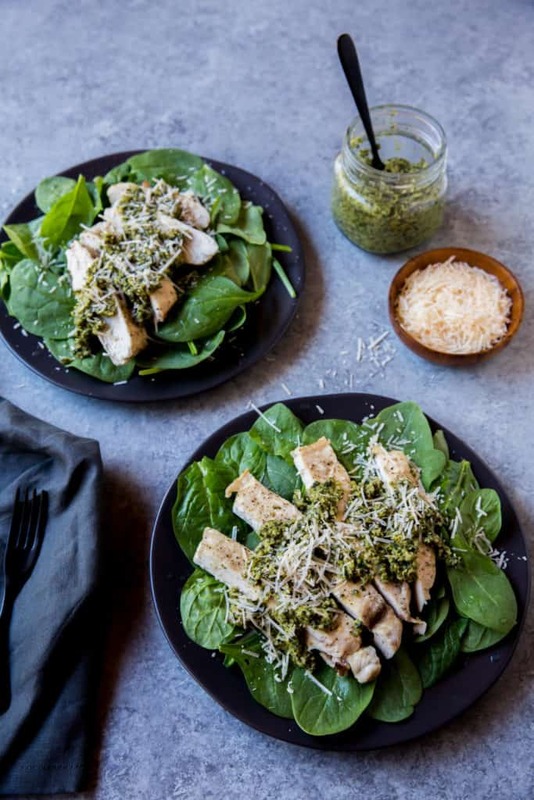 Sometimes easy recipes are the best kinds because we all have busy nights and want to whip up something delicious and quick, like this Easy Pesto Chicken Recipe! We give you the basics of cooking chicken breasts perfectly in the oven and the ingredients for a creamy pesto sauce made perfect every time. You can't ask for more with a simple keto dinner recipe! A Simple, Creamy Pesto Sauce! I always felt like the only way to enjoy a delicious creamy pesto was if I bought it in the store or ordered it at a restaurant. It wasn't until I was on a keto diet that I realized how easy it is to make and how great it is for adding fats to meals! All you need is a base of fresh basil, some olive or avocado oil and salt and pepper! Aside from that you can amp it up with some nuts of choice, we love walnuts, and some grated Parmesan! Blend everything up and you can store it in the fridge as a savory fat bomb to add your nightly meals! We love to top our Chicken Crust Pizza with this pesto sauce too. makes for the juiciest chicken! When cooking chicken in general, especially chicken breast, stove top or microwave methods can totally dry out the chicken making it chewy and hard to enjoy. However, cooking all meats in the oven guarantee a juicy piece of meat! We always like to sear our meats on the stove top and then finish them off in the oven to ensure the meat doesn't lose all of its juices and dry out. Give our roasted red pepper chicken thighs a try if you don't believe us! The pesto recipe we've given you in this post is great to make in bulk, store in the fridge and add to any meal you make to up your fats on the day! If you're not a fan of chicken breasts, no biggie, make this pesto sauce and any meat you want to pair. 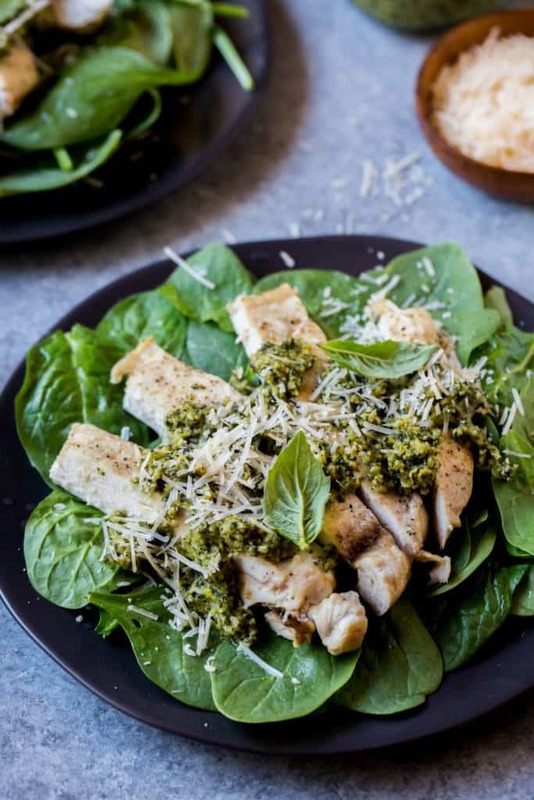 What we love most about this Pesto Chicken Recipe is how quick it takes to make on busy nights! 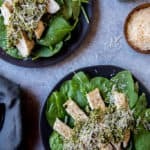 Recipe can be quickly added to MyFitnessPal - Search "KetoConnect - Easy Pesto Chicken"
Preheat oven to 450 degrees. If desired, pound chicken breasts lightly so they are of even thickness, then dry with paper towels. Pour oil in a 9x13 baking dish. Roll the chicken breasts through the oil to coat it, then place chicken breasts side by side in the dish. Combine salt, pepper, onion and garlic powders in a small bowl. Sprinkle mixture over chicken and rub with your hands to coat in the oil and seasonings. Bake uncovered for 15-20 minutes, or until a meat thermometer reads 160-170 degrees. While the chicken is baking, make the pesto sauce. Place all the pesto sauce ingredients into a blend and pulse until smooth. Add more olive oil for a thinner sauce. Once chicken is out of the oven serve immediately with a dollop of pesto sauce on top. Enjoy!